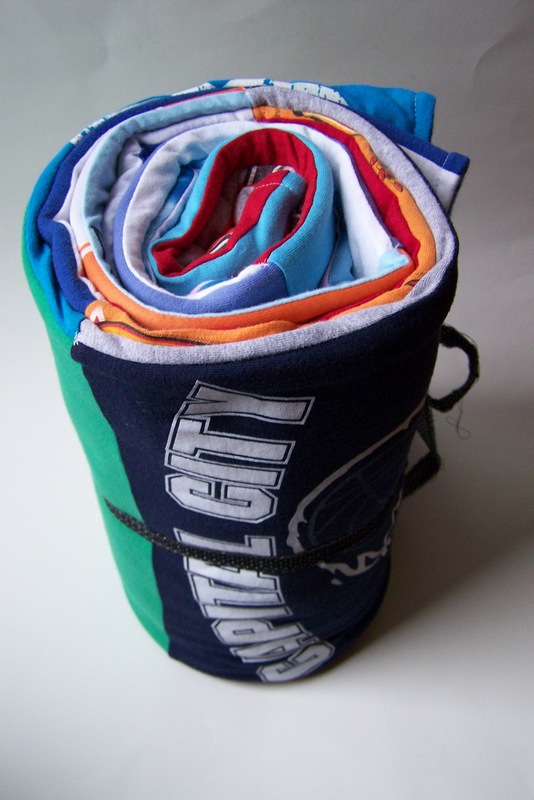 New in the Shop – New T Shirt Blanket! I love the opportunity to work with customers to create what they envision. I had the opportunity to create two quilts for young woman and her sister. These are similar to the Stadium Blanket I made for my friend. However, it uses smaller squares and a polar fleece background. This is a simple blanket. It does not have the “frames” of my 12-shirt quilt. However, it is about the same size. It is very soft and cuddly since it is made out of all knit fabric! It’s a wonderful throw and could work well as a picnic blanket or stadium blanket! It is a great way to plow through a collection of high school, college, sorority, dance, and fundraiser shirts! My customer gave me very nice feedback! I hope her sister loves it! I have consolidated my 20-shirt quilts into one listing on my website and Etsy with options for square size and backing fabric. The quilt is fantastic! I really like the new look! Annie is a great model!